I am a bit intimidated by indigo. Perhaps I have just made it a major performance each time I have attempted it so far–overreach is a superpower I have in spades. But the temperature maintenance, chemistry, my lack of experience and (in the case of the hydrosulphite vat) my aversion to the chemicals involved, all make me wary. Anyway, I overcame my reluctance and ran a vat last weekend. 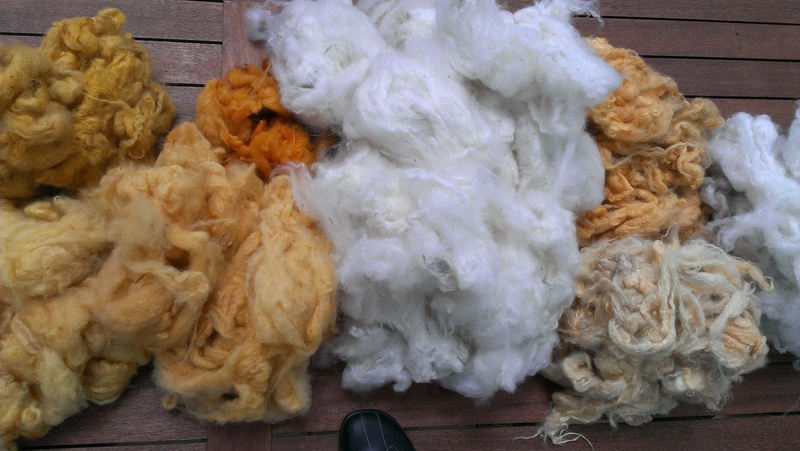 I made an assessment of the fleece I might dye –in varying states of yellowness and natural whiteness (with a little tan), corriedale and polwarth. The quiescent vat has been dormant since January, since I failed to make a successful fermentation vat using ambient summer temperatures. It has only been waiting 10 months for resurrection! It contained madder and bran as well as indigo due to its first life as a potential fermentation vat, so the night before, I sieved out all the larger particles remaining rather than have them distributed throughout my already less than pristine fleece. I wetted out my fleece and some brown polwarth slippers in readiness. 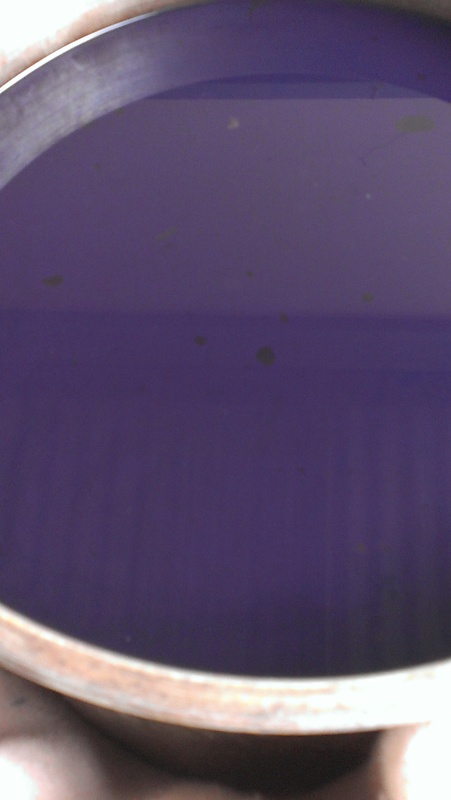 The vat was a far more exciting colour after warming and the addition of colour run remover. I had read Vivien Prideaux and Jenny Dean in preparation and realised some guesswork would be required. How much colour run remover? How much could I hope to dye? 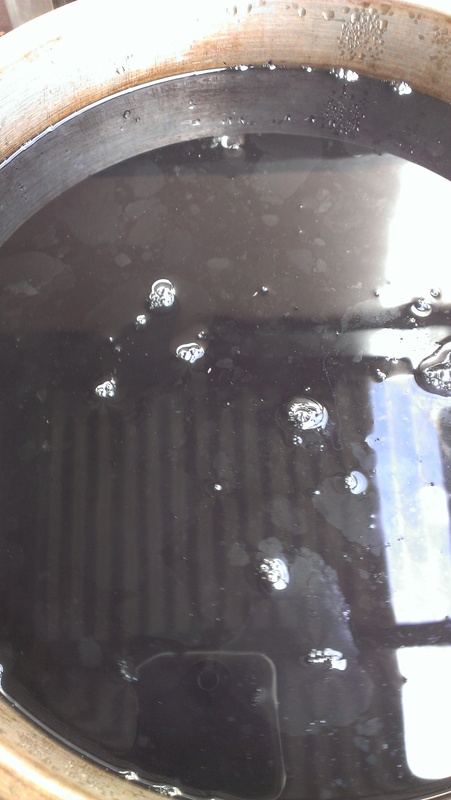 Just the same, this is the second half of this vat I have managed to render useable by this method, another reason to think I should give up being intimidated and get on to practising fermentation methods. Perhaps, just like sourdough bread, it isn’t as delicate as you might think at first–even if time needs to be on your side. It was very reassuring to see that telltale yellow-green colour appear under the surface on my silk embroidery thread. And afterward, while still wet. Some of the greens will be quite emerald when they are dry, I think, but the paler yellows became blue rather than green. The slippers took up blue where they were white or pale purple from the tail end of a logwood exhaust bath, but took virtually no colour on the brown parts, which is to say, most parts. It may be that the vat was exhausted–not completely, or the pale parts would not have taken up colour–but sufficiently that no colour change showed up on the brown. It may also be that they were greasy enough to repel the dye somewhat and that so much wet fleece having entered it, the vat was diluted. So I have kept the vat aside for another day or a new thought on the matter. Thank you for sharing your indigo experience. I am totally intimidated by the process which is why all the materials are sitting in my basement untouched. The colors you have shown are so pretty. I hope you’ll give it a try. I do understand that chemistry can explain the process, but I can more than understand why it was treated as magical for so long! The colours are wonderful and the process is fascinating to observe. I couldn’t hope to capture it in photos with only two hands! 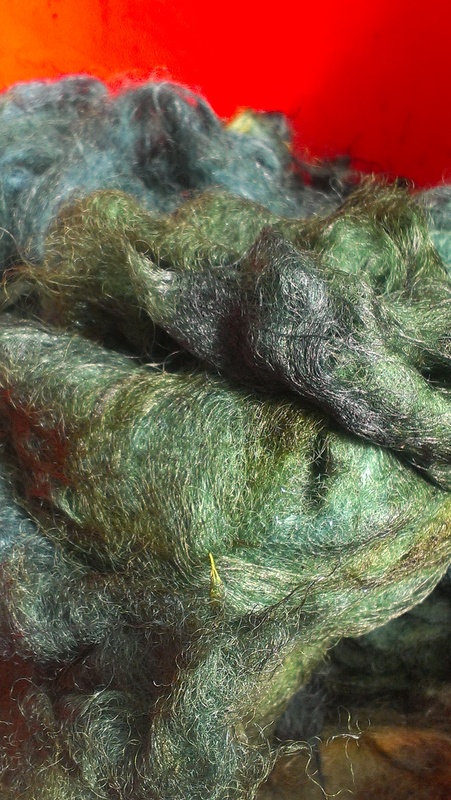 There are loads of skilled dyers on Ravelry discussing vats of all kinds and how to make them work better, if you would like to be part of a supportive ongoing conversation. 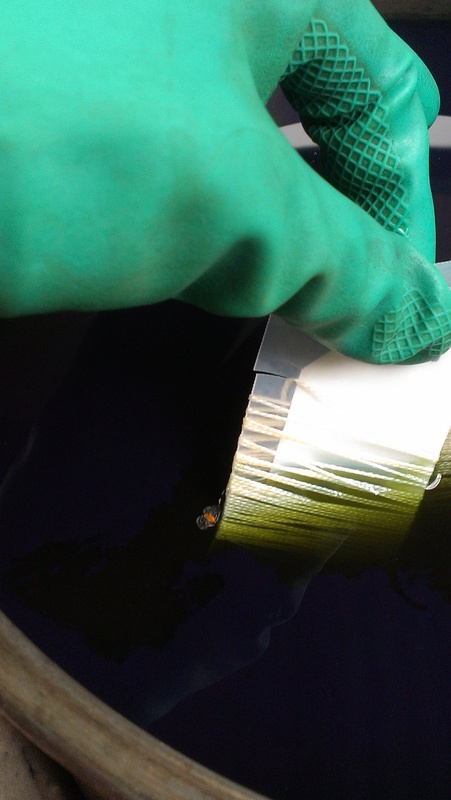 I’ve been relieved to find that I can rescue experiments that fail without wasting the indigo by using this method. The thought that if I made a mistake I would waste everything had been one of the things that was preventing me experimenting. I might have to consider checking out Ravelry, I see so many links to the site. Thanks for the info. I like it very much. 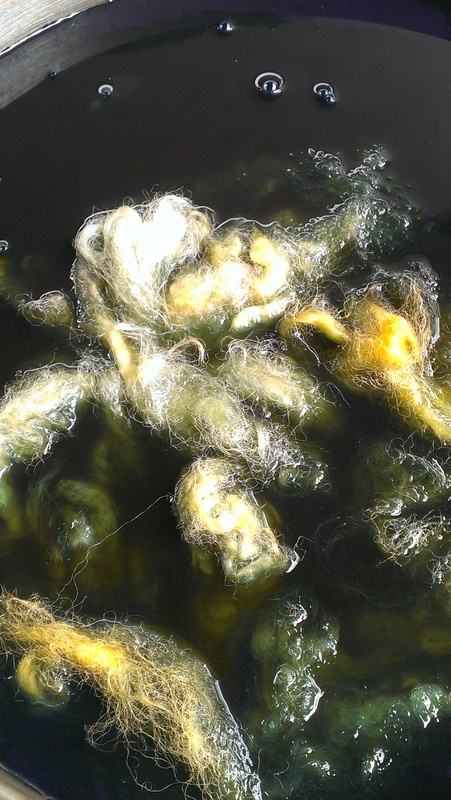 There is a great forum called Natural dyeing and I am a moderator on another called Natural dyeing down under (which focuses on plants indigenous to Australia and NZ). Now you are selling me on checking it out! 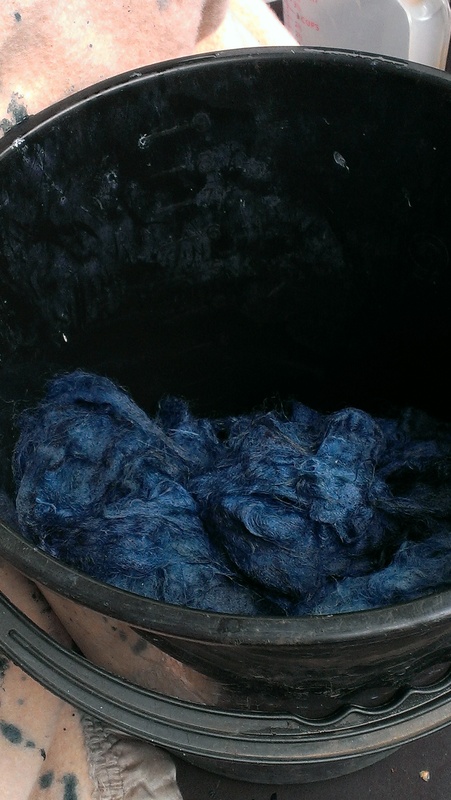 I have a bucket of woad dye sitting there waiting, but I may just go out and see if I can get another picking, or if it’s too late – I do have some fleece I could throw in aside from the yellow skeins waiting. Your results look promising! Looking forward to seeing how your woad tursn out! 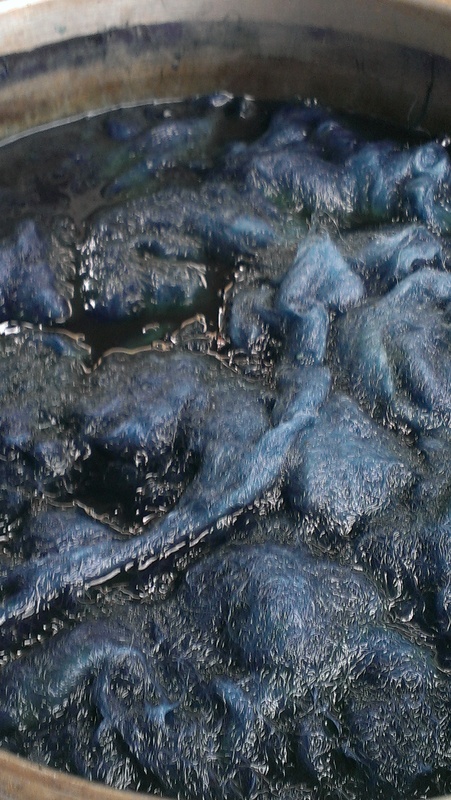 I think that you got some pretty exciting colors from your vat! 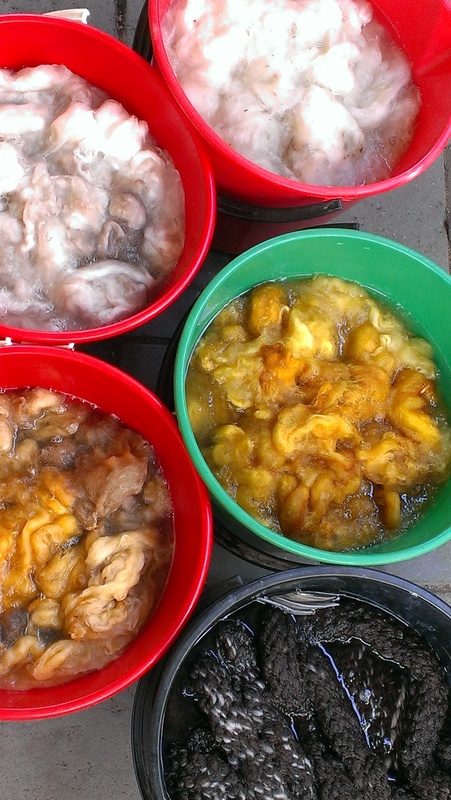 I can’t wait to see the yarns you spin…. they will be lovely! Love the silkworm housing development! Pretty funny, I think! 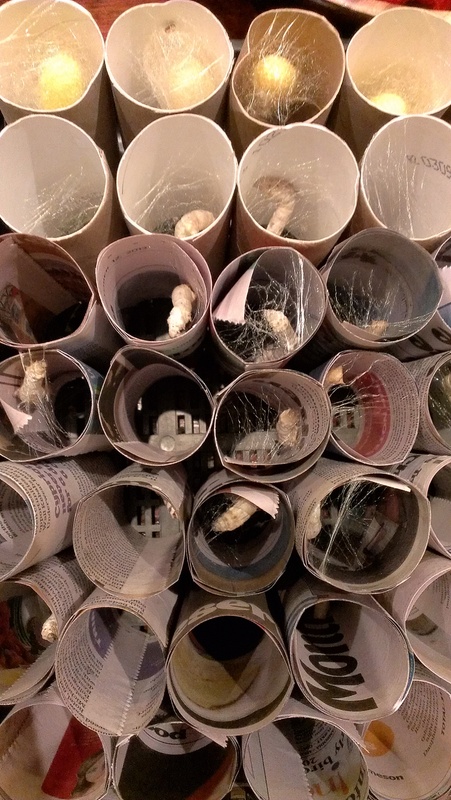 I added yet more newspaper tubes last night. I don’t think of caterpillars as a major manure source usually, but, ahem, they do produce, especially when they are so large! The tubes help keep the cocoons clean.